Audi knows how to deliver on excitement, and we shouldn’t be too surprised to see the latest Audi R8 Coupe RWS offered for that extra special rear-wheel x-factor driving experience. There won’t be many of these models available on a global scale, 999 in fact, and so if you want a really quick Rear Wheel Series (RWS) R8, then this is your chance. The RWS bit of the R8 means that you’ll be getting distinctive rear-wheel driving characteristics behind the fabulously balanced chassis, along with Audi’s V10 power. 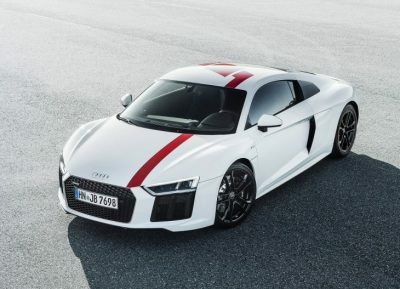 Expect the new Audi R8 Coupe RWS to complete the 0-100 km/h dash in 3.7 seconds. You have all the muscle to get yourself through to a top speed of 320 km/h, and the 5.2-litre V10 FSI breathes cleanly and packs a hell-of-a punch. Peak power dials in at 397 kW, while 540 Nm of torque is ready to propel you forward with loads of thrust and passion. Audi’s R8 V10 engine is one of the best sounding supercar motors around, and the roar you can hear from the driver’s seat feeds the adrenaline rush. Having been tweaked for rear-wheel drive only, the car loves to glide through the corners in an easily controlled drifting slide. What a way to dial on the smiles! The car’s V10 powerhouse is linked to a seven-speed S tronic transmission that is very fast between gates and superbly matched for optimum power delivery. This is a car that can be driven really quickly on any track with a delightfully sophisticated chassis set-up. Being RWD, the R8 coupe focuses the job of steering and braking on the front wheels. On the exterior of the 2018 Audi R8 Coupe RWS you are well set-apart from the other R8 models thanks to some exclusive detailing that features different coloured side-blades for the Coupé models. The upper side-blade is coloured in Mythos black and the lower side-blade is painted in the body colour. An option for the RWS Coupe R8 are Sport decals in Misano red. You’ll love the front and rear air intakes that feature in a matt titanium black, while the exclusive 19-inch alloy wheels are boasting a 5-V-spoke design that’s finished in high-gloss black to complete what is a striking supercar appearance. Air channels at the front along with the leading grille provide a honey cone design specific to the RSW model. Headlight technology uses purely LED vision for both day and night driving. The DRLs are very striking and attract plenty of visual impact. There is plenty of carbon fibre material used on the body work, which is strong and super light. Front and rear cameras detect parking distances, and Audi R8 models also boast adaptive cruise control and accident avoidance technology. Inside the Audi R8 Coupe RWS models is still a luxurious interior with loads of style, yet with the emphasis on sportiness. Deep bucket racing seats are very supportive and comfortable, and there is plenty of scope for getting nice and comfortable behind the wheel. Aclantara leather, accentuated stitching, aluminium trim, carbon fibre inserts, futuristic air vent designs, clever audio speaker mounting, virtual LED instrumentation for the cockpit and even an interior badge on the deep dash that reminds you that you are 1 of the 999 R8 RWS Coupes built. Steering-wheel mounted satellite navigation, Bluetooth communications and audio controls are standard. The centre console has a very nicely designed layout with modern features, carbon fibre trim, and switchgear combined with the sleek gear lever for a premium motoring experience. Paddle shifters are also mounted on the steering wheel. At the front of the new R8 Coupe RWS is a luggage space positioned under the hood which can be lifted remotely. It’s a handy space for carrying luggage for a weekend away; however, it won’t swallow copious amounts – that’s for sure. A 12 V socket and a strong light come as standard in the front luggage compartment along with some small cargo nets. This car is all about the journey and going places fast. New Audi R8 RWS models come with Audi Space Frame technology that boasts multi material lightweight carbon fibre and aluminium construction. The car is a mid-engine design, with an Audi Sport exhaust system with high gloss black tailpipes for that premium look. A Spyder version of the RWS R8 is also available. Buy one of these and you’ll be getting an appreciating classic. For any more information on the new Audi R8 Coupe RWS or, for that matter, any other new car, contact one of our friendly consultants on 1300 303 181. If you’d like some fleet discount pricing (yes even for private buyers! ), we can submit vehicle quote requests out to our national network of Audi dealers and come back with pricing within 24 hours. Private Fleet – car buying made easy!